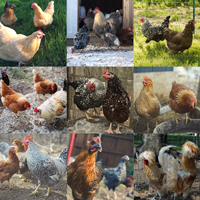 We have over 60 different purebred standard varieties of baby chicks each hatch. It is never possible to estimate exactly how many of each there will be or to book specific breed orders for all of them in advance. Therefore, we offer this SPECIAL ASSORTED BARGAIN in order to use up all of the extras and odd lots.